As we celebrate Women’s History Month, we also take time to pay homage to Elizabeth Coffal Robinson and Betty Blankenship. 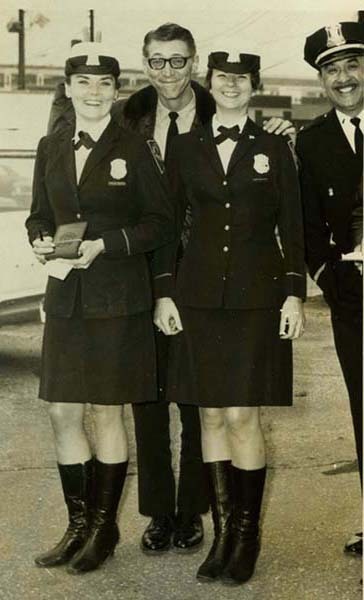 Classmates at the Indianapolis (IN) Police Academy in 1967, the two would go on to become the first women assigned to patrol together in the country. Prior to Robinson and Blankenship’s patrol partnership, women in law enforcement performed mainly secretarial or social work duties. standing on either side of a man in glasses, 1970. 2011.40.47. Collection of the National Law Enforcement Museum. Washington, DC. The pair were assigned to patrol in Car 47. As policewomen, they faced some unique challenges. A senior officer would usually ride with new officers for several months to assist with on-the-job training, but the two new female officers were left on their own. “We were put out on the street with no training whatever. We had to monitor both radio frequencies, but we had no idea how to even answer the radio,” Blankenship told Indianapolis Magazine. Their uniforms also posed a challenge. The policewomens’ uniforms included a skirt and heels, making it difficult to run while pursuing a suspect. 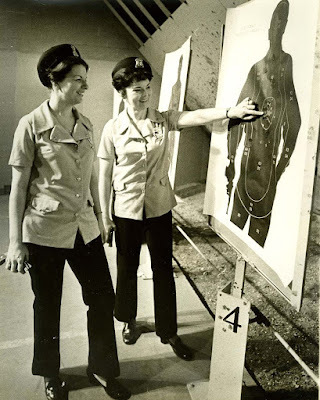 They were also required to store their handguns in their purses, rather than on a duty belt because policewomen had previously not been assigned to patrol work that might require quick access to a gun. This made it difficult to reach their guns quickly in an emergency. In response, Robinson and Blankenship came up with a new uniform design, similar to a maternity top which concealed their service weapons underneath, allowing for quicker access than reaching into a purse. Photograph: Officers Robinson and Blankenship. 2011.40.73. Elizabeth Coffal Robinson and Betty Blankenship both rose to the rank of sergeant. Their partnership paved the way for future female law enforcement officers to take on the same responsibilities as their male counterparts.